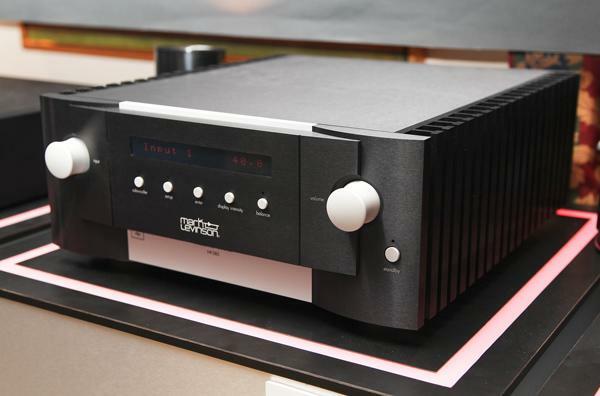 In response to Mark Levinson Audio Systems' 40th Anniversary, the company has announced a new line of products for the two-channel audiophile, the 40th Anniversary Collection at CES 2012, which includes the $25,000 No.52 Reference dual-mono preamplifier, the $10,000 No.585 integrated amplifier, the $6000 No.519 SACD player and the $6000 No.560 digital processor. 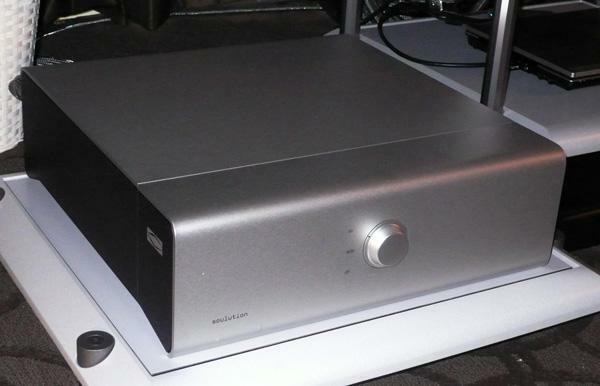 I was most intrigued by the $10,000 No.585 integrated amplifier shown in the photo, which is rated at 225Wpc into 8 ohms, and provides a dedicated subwoofer output. 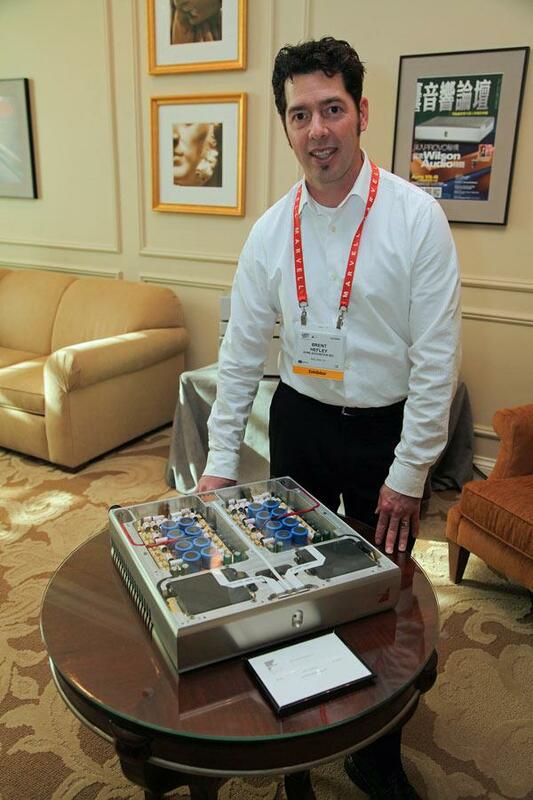 Soulution Audio's Cyrill Hammer was on hand to discuss the company's "small" Soulution 501 mono Amplifier ($55,000/pair). Similar in design to the Soulution 710 stereo amplifier that had so impressed Michael Fremer in the August 2012 issue of Stereophile, the more diminutive 501 monoblock amplifier is rated at 125W into 8 ohms, utilizes six switching-mode power supplies, and features a high-bandwidth, zero-feedback voltage-amplification input stage. Unlike the 176 lb Soulution 710 stereo amplifier that required three good men to move into Mikey's listening room, the 501 weighs in at a "mere" 80 lbs per chassis. 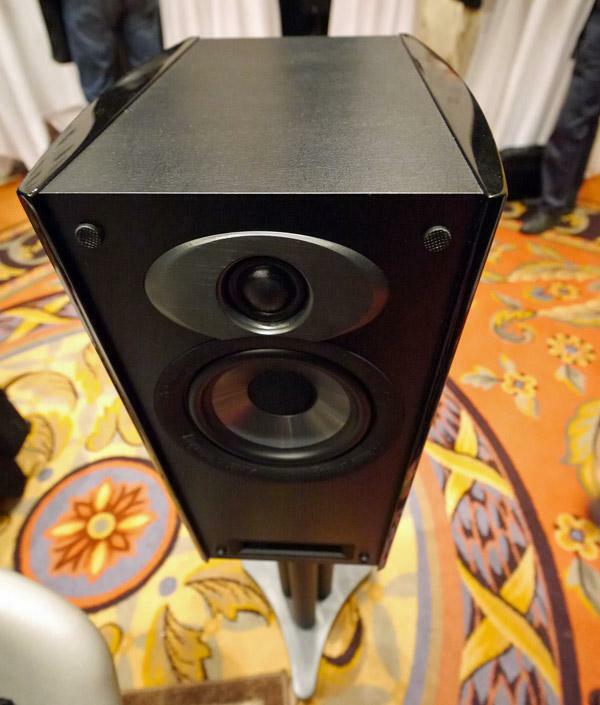 Harman Specialty Audio introduced the new Revel Performa 3 series of loudspeakers at the 2012 CES. 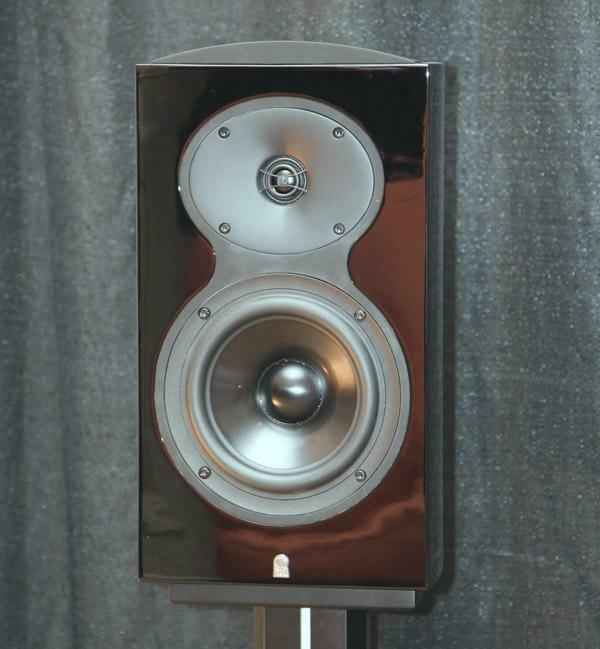 Kevin Voecks, lead audio engineer in the design, was delighted at the increased performance of Performa 3 series, including the $4500/pair, three-way, F208 full-range floorstander and the $1750/pair M106 two-way bookshelf. The F208 replaces the more expensive, $7500 F32 Performa in the previous series. Kevin Voecks Rocks the Room Acoustics with Studio 6's iPad App. 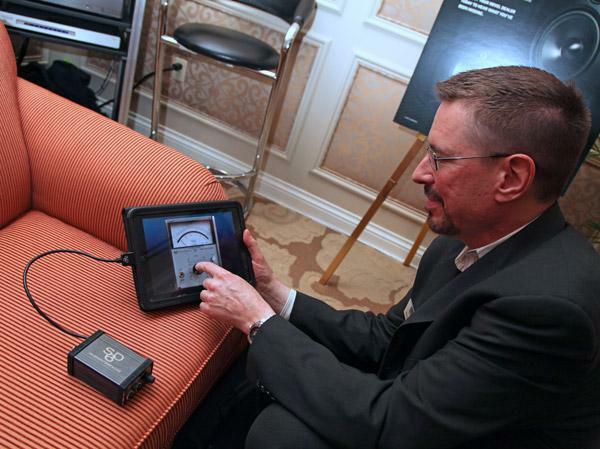 Harman Specialty Audio's Kevin Voecks demonstrated his latest portable room-response testing system, an iPad 2 running Studio Six Digital's "Audio Tools" iTunes app. (A favorite of JA’s.) The iPad 2 plus a $50 external mike and an accessory box from Studio Six becomes a portable audio test system with up to 1/48-octave resolution. Kevin used this tool to set up Revel's new M106 and F208 loudspeakers on the 35th Floor of the Venetian Hotel. He demonstrated frequency response graphs and a virtual SPL meterseen in detail as a graphic representation of a huge analog SPL meter on the iPad screen. 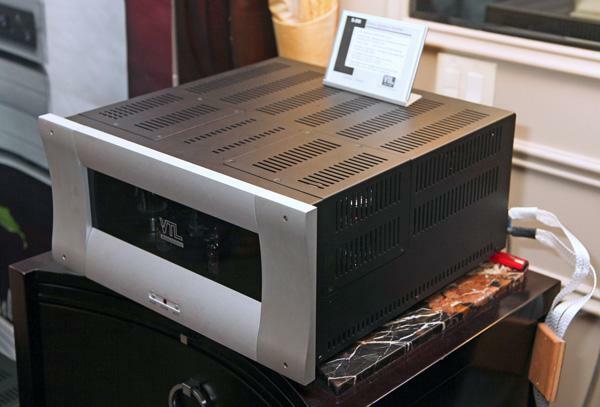 Luke Manley and Bea Lam of VTL were on hand as host and hostess at the VTL exhibit suite at the Venetian Hotel to present their two new stereo tube amplifiers, the $33,500, 400Wpc S400 Series II amplifier, and the $10,000, 200Wpc S200 Stereo Signature amplifier shown in the photo. Although the S400 was configured into a floorstanding tower and the S200 in the rack-mounted chassis used for their MB-450 monoblock amplifier, both new products feature VTL's latest tube technology, including fully balanced, differential input stage, VTL's SmartTube technology with automatic bias and screen supply adjustments and fault sensing, and a new user-adjustable damping factor feedback control. 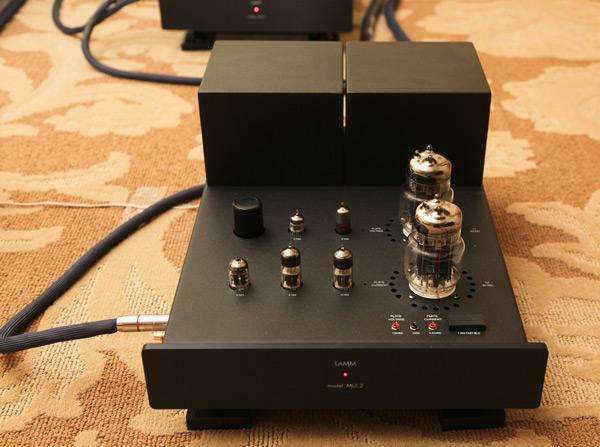 The feedback loop amount can be precisely set to suite the listener's taste via three-position switches located between the input tubes on the top of the chassis. 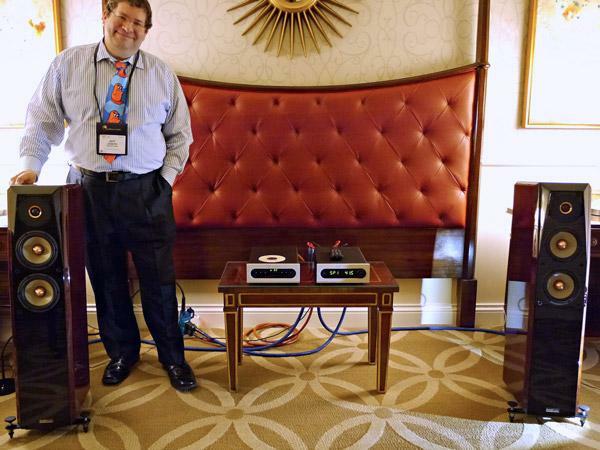 Joseph Audio's Jeff Joseph is always a smiling, positive presence at CES and other shows, and always seems to have something new in his speaker line, even if "new" is defined as "finally in production." This describes the Perspective ($11,800/pair), making good sounds with relatively affordable Bel Canto equipment ($2995 digital receiver and CD3 transport). 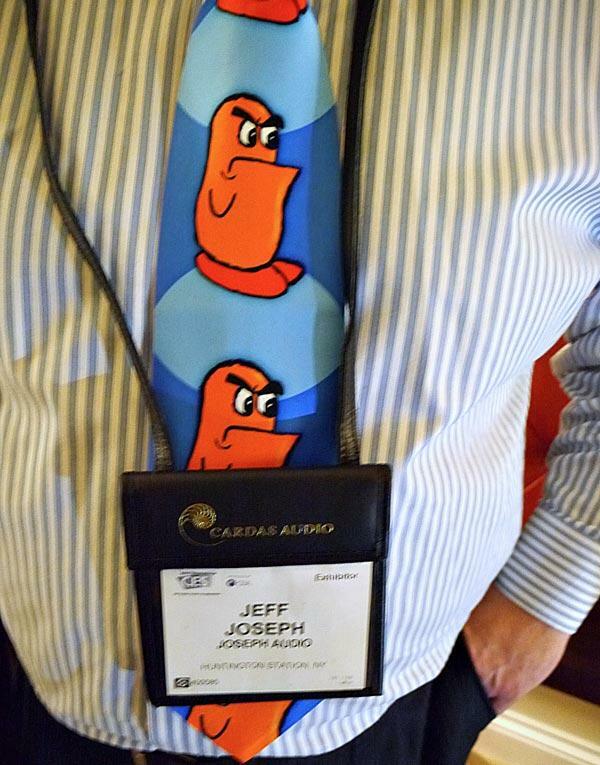 The tie Jeff is wearing has cartoon figures designed by Joshua Joseph, Jeff's 11-year-old son. A close-up of the Joshua Joseph-designed tie. A 2012 CES highlight! 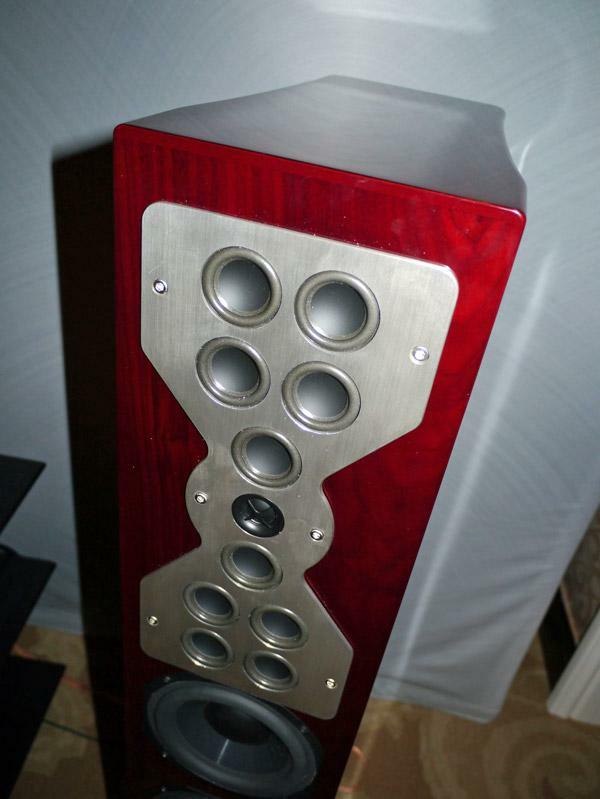 I know of speakers where, depending on the crossover, the same 5" or 6" driver is used as midrange or as woofer, but I've never encountered a speaker where a driver normally designated as a tweeter also functions as a midrange. This is the unusual design approach taken by McIntosh in some new speaker models, including the $10,000/pair XR100, and, judging by the sound, it certainly works for them. The driver is a 2" metal dome: eight of these are combined to serve as midrange, with two more as the tweeter flanking a supertweeter. Atlantic Technology's AT-1, which uses their patented H-PAS venting technology, was one of the hits of last year's CES, and the positive impression was confirmed in Erick Lichte's review (September 2011). The H-PAS approach has now been applied to the new AT-2 ($1800/pair). The 3dB point is specified as 41Hz, which I'm told is an anechoic figure. This normally translates to in-room response to the low 30s, and the sound of the AT-2 in the Venetian's less-than-ideal space seemed to confirm this. The business card of Eventus Audio's designer, Domenico Fiorentino, says "Fine Italian Products." But even if it didn't say that, even a casual look at the curved lines and impeccable finish of the Eventus speakers will immediately make you think that the speakers must be made in Italy. Their latest iO line is designed to bring the quality of their cost-no-object offerings to a more affordable level. North American prices are yet to be determined, but the stand-mounted two-way iO is 2500Euros/pair and the iO.f three-way floorstander is 5500Euros/pair. 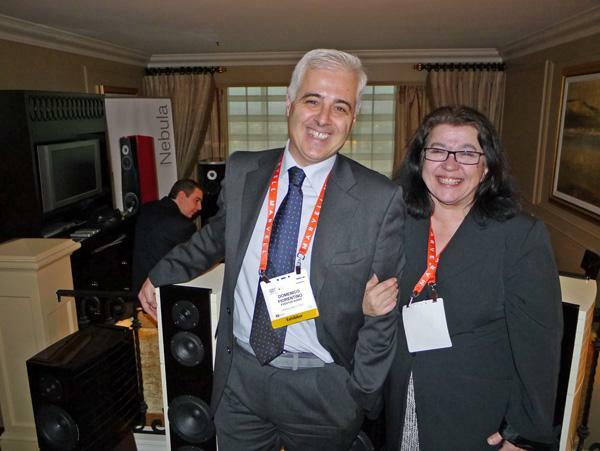 Fiorentino is pictured here with Angie Lisi of Audio Pathways, the North American distributor of Eventus. Brent Hefley, Marketing Manager of Ayre, walked me through the circuit layout of Ayre's newest amplifier, the $14,950, dual-mono, 200Wpc (8 ohms) VX-R. Based on the well-regarded and long-established MX-R monoblock and introduced at the 2011 CES, the VX-R uses Ayre's ultra-fast printed circuit board materials. Ayre is expecting great things, Brent told JA, from its recent hiring of ex-Classé and Linn engineer Alan Clark, who joins Charlie Hansen and Ariel Brown as the Colorado company's creative engine. It was good to visit McIntosh Laboratory's 35th floor suite at the Venetian Hotel and spend a few minutes with Ron Cornelius, the product manager, discussing our shared experiences with the legendary McIntosh MR-78 FM tuner. 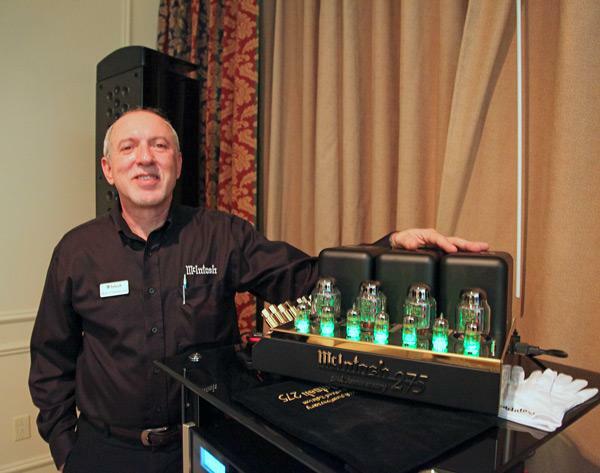 Ron showed me the latest iteration of the company's MC-275 tube amplifier. Now released as version 6, 50th-Anniversary 275, priced at $6500, it reminded me that the amplifier was first shipped in 1961. I visited Burmester's President, Dieter Burmester, in the German company's Venetian Hotel Suite. As well as high-end audio products Burmester also manufactures high-perfomance music systems for the Bugatti Veyron and Porsche sports cars. I mentioned that I saw Dieter's likeness in a sketch for an interview with him and Richard Chailly that appears in the latest Christophorus, the Porsche's owner's magazine. That led to chat about our favorite automobiles, and from there to high-end audio. Dieter hopes putting high-end audio in the Porsche Panamera and 911 automobiles will introduce high-end audio to a younger but affluent generation now focused on limited-fidelity MP3 on their iPods. I heard very detailed and rich sound in the exhibit run by Lamm Industries and by Verity Audio. The system setup included $95,995 Verity Audio Lohengrin II speakers, $37,190/pair Lamm ML2.2 single-ended, dual-chassis 18W amplifiers, a $28,000 Kronos turnable with a $5,200 Phantom II XL12 tonearm, $5500 Dynavector X1Vs cartridge, and $97,000 worth of Kubala-Sosna interconnects, speaker cables and power cords. Julien Pelchat, the Vice-President of Verity Audio, walked me through the design of the Lohengrin II speakers. Sumiko teamed up a pair of Sonus Faber Amati Futura floorstanding speakers  watch for JA's review in the March 2012 issuewith the $4500 REL Gibraltar G1 subwoofer to produce explosive, massive, but tightly controlled bass while playing the "Chinese Drum Poem" selection from disc 3 of the Burmester Demonstration Disc series. The REL G1 is a 108 lb, closed-box, front-firing 12" driver driven by a 600W, high-current amplifier. Sumiko's John Hunter set the gain of the G1 using a small remote. 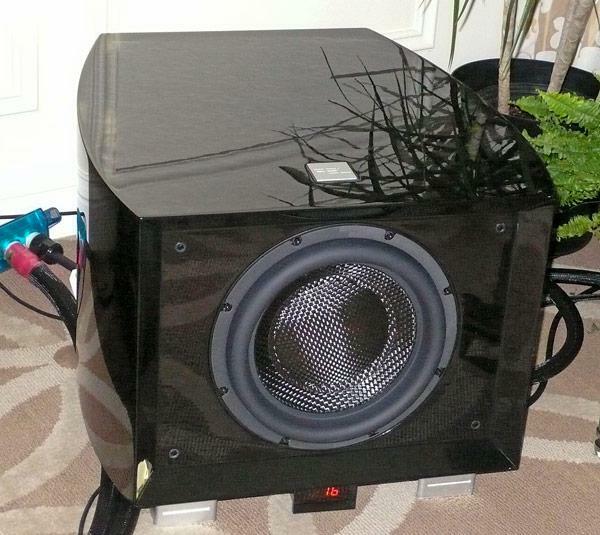 The G1 subwoofer fell totally silent when the music was free of deep bass content, as it should.